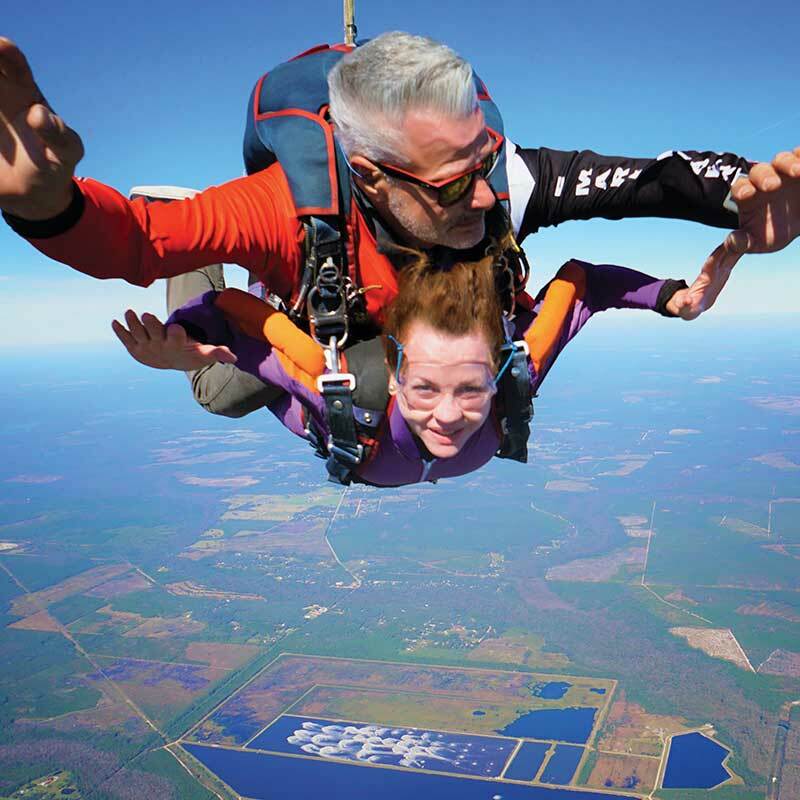 For Jackie Brooks, free falling from plane to earth is a family occasion and a tradition to be upheld. Wind ripped through the unpressurized cabin, rapidly changing the temperature from the pleasant 75 degrees on the ground to a chilling 35 degrees at 5,000 feet. The noise was deafening as three young men tumbled out the door, yelling “hop-n-pop!” as their parachutes disappeared into a blue abyss. These guys were taking short jumps (only 5-10 seconds of freefall) to practice flying their canopies. The door was shut behind them, bringing the noise level down to what I suspect my ENT would still deem dangerous to my long-term hearing. Moments before, the plane was full of men and women packed together like a panini sandwich straddling two metal benches wearing colorful parachute suits, Hermesesque helmets and goggles. My tandem instructor, Art, pulled straps securing me to his torso tighter than Gorilla Tape and super glue combined. The plane rattled and hit air pockets as it climbed to 13,000 feet, our point of debarkation. A general side note — the FAA requires oxygen masks after 13,500 feet. Art was chatting into my right ear, while I was preoccupied with that ever-present adult adage, “What in the world was I thinking?” Well, that’s really the point isn’t it? I wasn’t thinking; I succumbed to peer pressure to partake in a high-adrenaline activity to prove that I wasn’t really getting old. That was never actually said, but we all know that was clearly in the subtext. A few months before, our friend informed us he wanted to skydive to celebrate his 60th birthday. By the time we jumped, the number had grown to nine people, including both our families with adults and college-age children. I rationalized that if my mother at ages 70, 75 and 80 could skydive, I could skydive. There are pictures of her, tandem jumping, arms spread, sporting a 100-watt smile. She loved every moment. How hard could it really be? I was even having video made so I could proudly hang my picture next to my mother’s, an ode to mothers and daughters. The time came, as I knew it inevitably would, when that door opened at 13,000 feet. Crab-walking down the metal bench to the door, I smiled toward the videographer thinking this might be the only usable shot from this whole escapade. There was no more thinking. Within seconds, we were out the door. Now, I must tell you that I did have my eyes open at first, but staring at the earth racing toward me at 120 mph is not a comfortable feeling. I wasn’t afraid, but I felt something I can only guess was akin to vertigo — an effect caused by a change in visual perspective. Art tells me later that this feeling is not unusual and can happen when the eyes, ears and brain have trouble assimilating what’s happening. Waiting a few seconds, I opened my eyes and looked toward the horizon. All things considered, this helped. There was one minute of freefall and four minutes of floating around, riding the air currents with an open parachute. My 20-year-old kids thought the freefall was the best part. I thought the parachute opening was the best part. I guess that’s the difference 40 years makes. I did get my picture to hang next to my mom’s. Her smile is genuine, mine is the consequence of temporary insanity. Jackie Brooks is a travel writer and mystery novelist in Panama City Beach. She is currently plotting revenge on her neighbor by including him on a hiking trip to Huayna Picchu in Peru. She may be reached at bythesee5@gmail.com.